Observations with telescopes at the ESO La Silla and Paranal observatories (Chile) have enabled an international team of astronomers  to measure the distance of a "gamma-ray burst", an extremely violent, cosmic explosion of still unknown physical origin. It turns out to be the most remote gamma-ray burst ever observed. The exceedingly powerful flash of light from this event was emitted when the Universe was very young, less than about 1,500 million years old, or only 10% of its present age. Travelling with the speed of light (300,000 km/sec) during 11,000 million years or more, the signal finally reached the Earth on January 31, 2000. The brightness of the exploding object was enormous, at least 1,000,000,000,000 times that of our Sun, or thousands of times that of the explosion of a single, heavy star (a "supernova"). The ESO Very Large Telescope (VLT) was also involved in trail-blazing observations of another gamma-ray burst in May 1999, c.f. ESO PR 08/99. One of the currently most active fields of astrophysics is the study of the mysterious events known as "gamma-ray bursts" . They were first detected in the late 1960's by instruments on orbiting satellites. These short flashes of energetic gamma-rays last from less than a second to several minutes. Despite much effort, it is only within the last few years that it has become possible to locate the sites of some of these events (e.g. with the Beppo-Sax satellite). Since the beginning of 1997, astronomers have identified about twenty optical sources in the sky that are associated with gamma-ray bursts. They have been found to be situated at extremely large (i.e., "cosmological") distances. This implies that the energy release during a gamma-ray burst within a few seconds is larger than that of the Sun during its entire life time (about 10,000 million years). "Gamma-ray bursts" are in fact by far the most powerful events since the Big Bang that are known in the Universe. While there are indications that gamma-ray bursts originate in star-forming regions within distant galaxies, the nature of such explosions remains a puzzle. 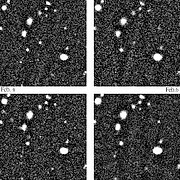 Recent observations with large telescopes, e.g. the measurement of the degree of polarization of light from a gamma-ray burst in May 1999 with the VLT (ESO Press Release eso9926), are now beginning to cast some light on this long-standing mystery. A gamma-ray burst was detected on January 31, 2000, by an international network of satellites (Ulysses, NEAR and Konus) via the InterPlanetary Network (IPN) . It was designated GRB 000131 according to the date of the event. From geometric triangulation by means of the measured, exact arrival times of the signal at the individual satellites, it was possible to determine the direction from which the burst came. It was found to be from a point within a comparatively small sky area (about 50 arcmin 2 or 1/10 of the apparent size of the Moon), just inside the border of the southern constellation Carina (The Keel). Follow-up observations were undertaken by a group of European astronomers  with the ESO Very Large Telescope at the Paranal Observatory. 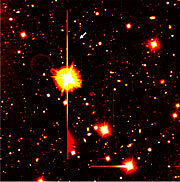 A comparison of several exposures with the FORS1 multi-mode instrument at the 8.2-m VLT ANTU telescope during the nights of February 3-4 and 5-6 revealed a faint, point-like object that was fading rapidly - this was identified as the optical counterpart of the gamma-ray burst (the "afterglow"). On the second night, the R-magnitude (brightness) was found to be only 24.4, or 30 million times fainter than visible with the unaided eye in a dark sky. It was also possible to observe it with a camera at the 1.54-metre Danish Telescope at the La Silla Observatory, albeit only in a near-infrared band and with a 1-hour exposure. Additional observations were made on February 8 with the SOFI multi-mode instrument at the ESO 3.58-m New Technology Telescope (NTT) at La Silla. The observations were performed partly by the astronomers from the group, partly in "service mode" by ESO staff at La Silla and Paranal. The observations showed that the light from the afterglow was very red, without blue and green light. This indicated a comparatively large distance and, assuming that the light from the explosion would originally have had the same colour (spectral distribution) as that of optical counterparts of other observed gamma-ray bursts, a photometric redshift of 4.35 to 4.70 was deduced . An accurate measurement of the redshift - hence the distance - requires spectroscopic observations. A spectrum of GRB 000131 was therefore obtained on February 8, 2000. At this time, the brightness had decreased further and the object had become so faint (R-magnitude 25.3) that a total of 3 hours of exposure time was necessary with VLT ANTU + FORS1 . Still, this spectrum is quite "noisy". The deduced photometric redshift of GRB 000131 predicts that a "break" will be seen in the red region of the spectrum, at a wavelength somewhere between 650 and 700 nm. This break is caused by the strong absorption of light in intergalactic hydrogen clouds along the line of sight. The effect is known as the "Lyman-alpha forest" and is observed in all remote objects . As ESO Press Photo eso0034 shows, such a break was indeed found at wavelength 670.1 nm. Virtually all light at shorter wavelengths from the optical counterpart of GRB 000131 is absorbed by intervening hydrogen clouds. From the rest wavelength of the Lyman-alpha break (121.6 nm), the redshift of GRB 000131 is then determined as 4.50, corresponding to a travel time of more than 90% of the age of the Universe . 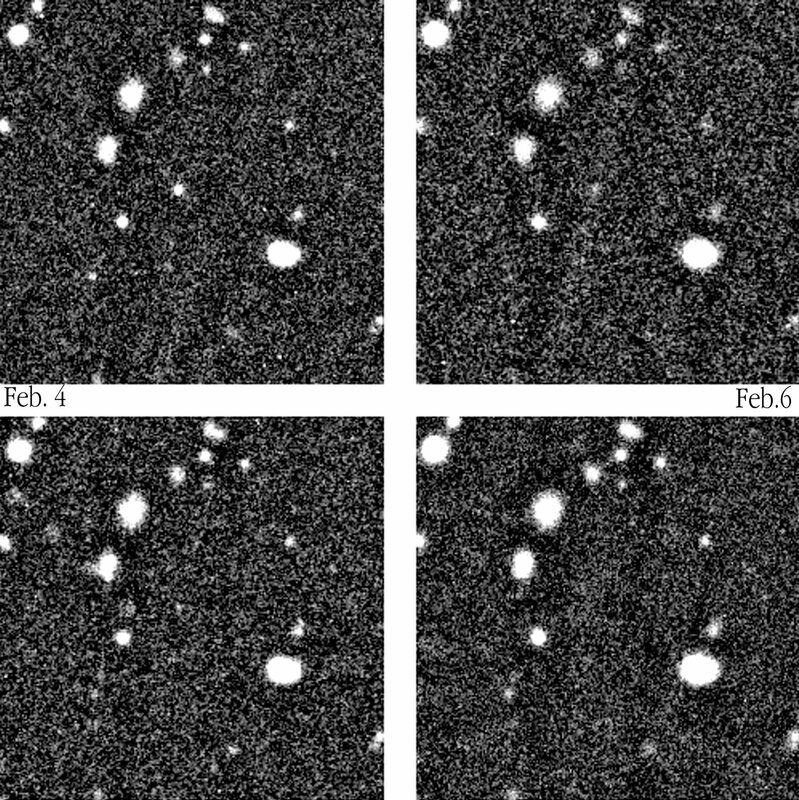 The measured redshift of 4.50 makes GRB 000131 the most distant gamma-ray burst known (the previous, spectroscopically confirmed record was 3.42). Assuming an age of the Universe of the order of 12 - 14,000 million years, the look-back time indicates that the explosion took place around the time our own galaxy, the Milky Way, was formed and at least 6,000 million years before the solar system was born. GRB 000131 and other gamma-ray bursts are believed to have taken place in remote galaxies. However, due to the huge distance, it has not yet been possible to see the galaxy in which the GRB 000131 event took place (the "host" galaxy). From the observed fading of the afterglow it is possible to estimate that the maximum brightness of this explosion was at least 10,000 times brighter than the host galaxy. The present team of astronomers has now embarked upon a detailed study of the surroundings of GRB 000131 with the VLT. A main goal is to observe the properties of the host galaxy. From the observations of about twenty optical counterparts of gamma-ray bursts identified until now, it is becoming increasingly clear that these very rare events are somehow related to the death of massive, short-lived stars . But despite the accumulating amount of excellent data, the details of the mechanism that leads to such dramatic explosions still remain a puzzle to astrophysicists. The detection and present follow-up observations of GRB 000131 highlight the new possibilities for studies of the extremely distant (and very early) Universe, now possible by means of gamma-ray bursts. When observed with the powerful instruments at a large ground-based telescope like the VLT, this incredibly bright class of cosmological objects may throw light on the fundamental processes of star formation in the infant universe. Of no less interest is the opportunity to analyse the chemical composition of the gas clouds at the epoch galaxies formed, by means of the imprints of the corresponding absorption lines on the afterglow spectrum. In this context, it would be extremely desirable to obtain very detailed (high-dispersion) spectra of the afterglow of a future gamma-ray burst, soon after the detection and while it is still sufficiently bright. It would for instance be possible to observe a gamma-ray burst like GRB 000131 with the UVES spectrograph at VLT KUEYEN at the moment of maximum brightness (that may have been about magnitude 16). An example of chemical studies of clouds at intermediate distance by means of a more nearby quasar is shown in ESO Press Photo eso0013. Attempts are therefore now made to shorten considerably the various steps needed to perform such observations. This concerns especially the time needed to identify the counterpart of a gamma-ray burst and - to a lesser extent - the necessary reaction time at the VLT to point UVES towards the object (in theory, a matter of minutes only). The launch of the HETE-2 (High Energy Transient Explorer 2) gamma-ray burst satellite on October 9, 2000, is a major step in this direction. Under optimal conditions, a relative accurate sky position of a gamma-ray burst may henceforth reach the astronomy community within only 10-20 seconds of the first detection by this satellite. The team consists of Michael Andersen (University of Oulu, Finland), Holger Pedersen, Jens Hjorth, Brian Lindgren Jensen, Lisbeth Fogh Olsen, Lise Christensen (University of Copenhagen, Denmark), Leslie Hunt (Centro per l'Astronomia Infrarossa e lo Studio del Mezzo, Florence, Italy), Javier Gorosabel (Danish Space Research Institute, Denmark), Johan Fynbo, Palle Møller (European Southern Observatory), Richard Marc Kippen (University of Alabama in Huntsville and NASA/Marshall Space Flight Center, USA), Bjarne Thomsen (University of Århus, Denmark), Marianne Vestergaard (Ohio State University, USA), Nicola Masetti, Eliana Palazzi (Instituto Tecnologie e Studio Radiazoni Extraterresti, Bologna, Italy) Kevin Hurley (University of California, Berkeley, USA), Thomas Cline (NASA Goddard Space Flight Center, Greenbelt, USA), Lex Kaper (Sterrenkundig Instituut ``Anton Pannekoek", the Netherlands) and Andreas O. Jaunsen (formerly University of Oslo, Norway; now ESO-Paranal). Detailed reports about the early observations of this gamma-ray burst are available at the dedicated webpage within the GRB Coordinates Network website. The photometric redshift method makes it possible to judge the distance to a remote celestial object (a galaxy, a quasar, a gamma-ray burst afterglow) from its measured colours. It is based on the proportionality between the distance and the velocity along the line of sight (Hubble's law) that reflects the expansion of the Universe. The larger the distance of an object is, the larger is its velocity and, due to the Doppler effect, the spectral shift of its emission towards longer (redder) wavelengths. Thus, the measured colour provides a rough indication of the distance. Examples of this method are shown in ESO PR 20/98 (Photos 48a/00 and 48e/00). In fact, the object was so faint that the positioning of the spectrograph slit had to be done in "blind" offset, i.e. without actually seeing the object on the slit during the observation. This very difficult observational feat was possible because of excellent preparations by the team of astronomers and the very good precision of the telescope and instrument. 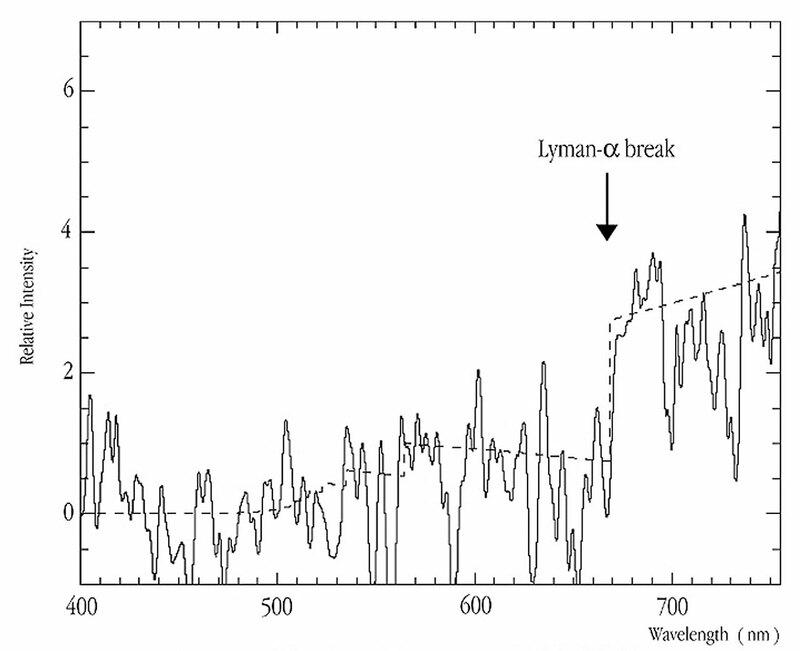 The " Lyman-alpha forest" refers to the crowding of absorption lines from intervening hydrogen clouds, shortward of the strong Lyman-alpha spectral line at rest wavelength 121.6 nm. Good examples in the VLT ANTU + FORS1 spectra of distant quasars are shown in ESO PR Photos 14a-c/99 and, at much higher dispersion, in a spectrum obtained with VLT KUEYEN + UVES, cf. eso0008. The research described in this press release is the subject of a scientific article by the team, entitled "VLT Identification of the optical afterglow of the gamma-ray burst GRB 000131 at z = 4.50"; it will appear in a special VLT-issue (Letters to the Editor) of the European journal Astronomy & Astrophysics (December 1, 2000). The results are being presented today (October 18) at the joint CNR/ESO meeting on "Gamma-Ray Burst in the Afterglow Era" in Rome, Italy. Note also the related article in the ESO Messenger (No. 100, p. 32, June 2000).